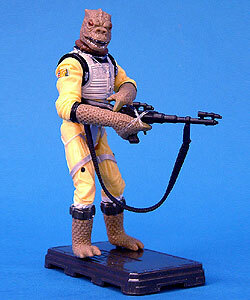 Comments: Bossk is a fearsome and heavily armed bounty hunter who tracks his quarry throughout the galaxy. He is hired by the evil Imperial Lord Darth Vader to capture the heroic Rebels who escape in the Millennium Falcon. Even though he is notorious in the galaxy for being a skilled hunter, he does not succeed in capturing han Solo and the other Rebels.